… and the rest of the year too! Since the 5057 left the roster of the Milwaukee Road, it has spent many years away from its ‘home’ territory. 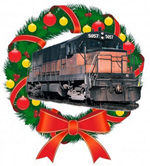 This holiday season, you have a special opportunity to help us get closer to our goal of bringing the locomotive back to the former Milwaukee Road right-of-way. Until December 25 a donor will match the next $1,000 we raise with an equal amount. If you donate now, you can double the impact of your contribution! Thanks to the generous ‘Friends of the 5057’ we’ve made a lot of progress this year. We’ve raised over $20,000 to bring the 5057 to Cle Elum and we are within $5,000 of meeting our next fundraising milestone by March 1. This would make us the proud owners of the 5057. How much closer can we get to this goal by the end of the year? Put the 5057 on your gift-giving list this holiday season!